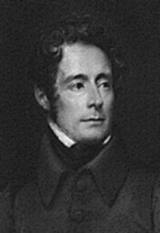 Alphonse de Lamartine (1790-1869) was a French poet and politician. His father had been imprisoned during the French Revolution’s Reign of Terror, but escaped the guillotine. Alphonse was educated by Jesuits, even though they were being suppressed at the time. In 1848, he led the provisional government when the Second Republic was proclaimed. His first book Méditations Poétiques (1820) established him as a popular poet within the French Romantic Movement, having been significantly influenced by the poetry of Lord Byron. In 1830 he published Harmonies Poétiques et Religieuses, which particularly expressed his Christianity. In 1832 he experienced a crisis of faith when his only remaining child died. In 1848 his political life fell apart, and he was left with enormous debt. He supported himself through his final years writing novels and historical works. When he died in 1869, he had nearly been forgotten, although is said to have re-established his faith. The following poem, translated by Geoffrey Barto, demonstrates Lamartine's deep questioning and struggle with God. That every truth finds in its path! And its deep sting remains in the human race's side. And that you alone would pay the earthly ransom. And that the celestial gift is too slow in coming.